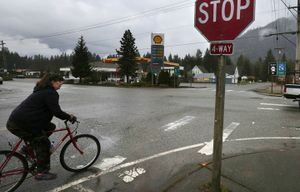 Charities took in more than $9.5 million after the Oso landslide last March claimed 43 lives. Here’s how that money is being spent. The donations arrived in small envelopes and packages, sent through the mail and, in one case, hand-delivered by a group of bikers traveling through the area. The checks were made out to Arlington’s Immaculate Conception Church, labeled as a donation to the landslide relief in neighboring Oso. Click the photo above to see The Seattle Times’ complete coverage of the Oso landslide, including investigative stories, profiles of the victims, interactive maps and a photo gallery. Unsolicited, the money kept pouring in, totaling about $350,000 just four weeks after the deadly landslide. Combined with money from Catholic Community Services, the church had more than $850,000 to spend. Charities took in more than $9.5?million after the landslide last March that took 43 lives, and some are still in the process of disbursing it for everything from mortgage payments to grief counseling. But the small Catholic church in Arlington had never dealt with money on such a scale. “It was overwhelming, keeping all the money accounted for,” the Rev. Tim Sauer recalled. With so much money funneling in to other churches and charities, Immaculate Conception along with Catholic Community Services decided to focus on one of the grimmest aspects of the slide: funerals, burials and cemetery plots. “We realized these survivors are carrying a backpack with 100 bricks, and one brick is ‘Where do I bury my loved ones?’?” Sauer said. The $460,000 that remains, Sauer said, will be used to pay for grave markers and, in the long term, mental-health services. So far, the fund has paid for 10 grave markers. Since the slide, the Red Cross, the United Way and the Cascade Valley Hospital Foundation have distributed, spent or committed to spend $6.8 million of the more than $9.5 million received by the three largest relief agencies. The remaining funds will be used for long-term recovery, the organizations say. The donations came from thousands of individuals and organizations in all 50 states and abroad and went toward a number of services. • $452,000 to United Way and Cascade Valley Hospital Foundation was distributed as emergency cash to meet immediate needs of those devastated by the slide. • $100,000 to Red Cross went to hire a full-time school counselor in the Darrington School District for three years. • $20,000 to United Way was distributed to the North Sound Society of St. Vincent de Paul for its “House in a Box” program, which provides replacement home furnishings to families affected by disaster. Donors might have imagined their dollars going straight toindividuals directly affected by the landslide, but it isn’t that simple. Large charities often make a needs assessment before distributing money, and then endeavor to send the money where it believes it will do the most good. It may go directly to individuals or it might go to organizations that provide services. United Way provides no direct assistance to individuals, said Neil Parekh, spokesman for United Way of Snohomish County. After the Oso landslide, the organization gave funds to North Counties Family Services and the Arlington Family Resource Project, among others. In the weeks after the landslide destroyed her Steelhead Haven house, someone handed Julie Kuntz a $50 bill as she was walking down the street. Another person brought over six cooked chickens. Yet a third gave her a quilt. She was also able to go to the Arlington Collection Center, known as The Hub, and pick up used clothing, furniture and appliances. “Imagine your own private Value Village,” said Kuntz, who had left her house with her husband and son 15 minutes before the slide hit. Her family received checks from multiple organizations, as well as several hundred dollars in gas cards. A friend set up one of many crowdfunding sites dedicated to those affected by the landslide. Theirs netted about $15,000. The Kuntz family still owes on the $200,000 mortgage for their destroyed house. North Counties Family Services provided funds for eight mortgage payments, Kuntz said. “We are from a strong community, and there was something beautiful about letting people see that,” Kuntz said. Each family affected by the slide was assigned a case manager, supervised by the Salvation Army. In an effort that is ongoing, case managers present each family’s individual needs to a long-term recovery group of charity representatives. Rather than having a system where each affected family receives a set amount of money, the managers assesses the needs of individual families, said Alan Pickard of North Counties Family Services, which served as a middleman between charities and beneficiaries to allocate funds on the Darrington side of the slide. On a rainy Wednesday this month, landslide survivor Robin Youngblood sat in her small cabin on Highway 530 just a few miles east of where the slide tore through her house. She motioned toward a few items in the living room: The coffee table is from The Hub in Arlington. The couch was $10 at Goodwill. The windows were donated, though she’s still not sure from which organization. “Dealing with the funders has almost been more stressful than going through the landslide, because it’s day after day,” said Youngblood, who has worked with three case managers. Immediately after the slide, she received funds from various organizations, but not since then, she said. She was able to get gas cards, but only about half the time she asked for them. She said she’s asked for a washer and dryer but hasn’t heard back. ”It adds up to an incredible amount of stress and tension,” Youngblood said. A few days after their home was destroyed, Julie Kuntz, her husband and son went to a mall to buy clothes and supplies. They saw a banner in the food court advertising ways people could donate to those impacted by the slide and touting the millions of dollars already donated for landslide relief. At that time, the Kuntz family had received only a $390 debit card. Though it took the organizations awhile to provide the most-needed services, she said, her family always felt taken care of. “There’s been a complete transition from the physical to the emotional,” said Heather Logan, hospital representative for Cascade Valley Hospital Foundation. Charities have sponsored grief camps for area kids, who may not have been directly affected by the slide but likely know someone who was. Red Cross, for example, will fund Camp Noah, a national program held locally for elementary-school children whose communities have been hit by disasters. “They were seeing things you never want to experience,” Sauer said. Members of the Kuntz family are among those who said they have benefited from the mental-health services. This summer, they took a trip to Central Washington, where wildfires had ravaged entire neighborhoods. They came across a family with a little girl sifting through the charred remains of their house.